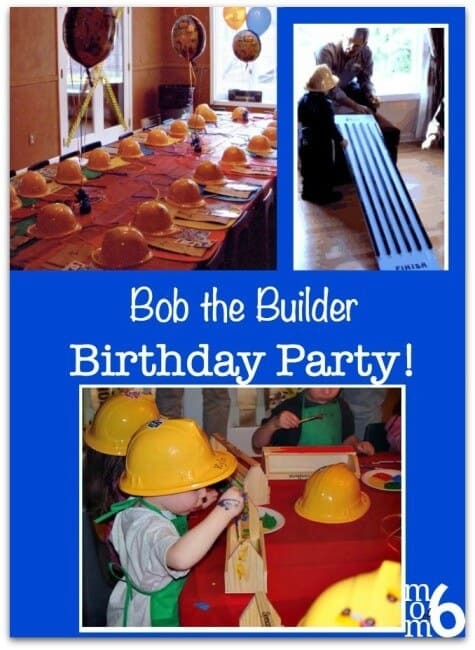 Great 3 Year Old Birthday Party Idea: A Bob the Builder Party! Okay- so let me just set the scene…… my oldest son was about to turn three years old, and I couldn't wait to celebrate with a full-on birthday bash (notice that I said “I” couldn't wait….. 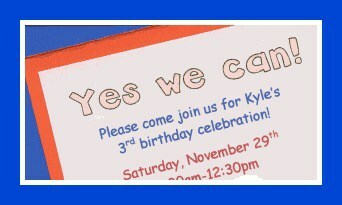 I am not even sure that Kyle was asking for a party)! 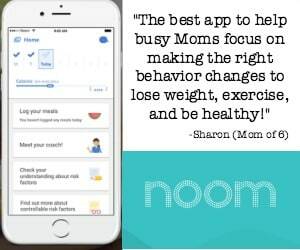 It didn't matter that I had a 20 month old, and a brand new baby (3 month old)…. AND that we had just started a renovation project on our house to add on two additional bedrooms….. 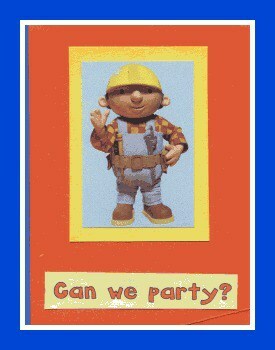 I was having this party! 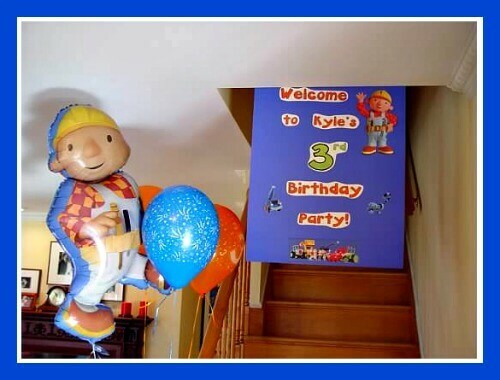 Kyle was a fan of Bob the Builder, and since our front yard was already “decorated” with construction equipment, this seemed like a good theme for our party. HAVE A NERVOUS BREAKDOWN BECAUSE THIS IS INSANITY!!! But allow me to show you the results of all of my hard work…. here it is- in all it's glory……. 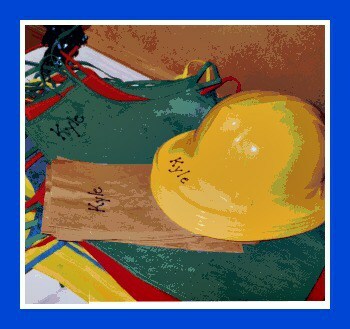 Kyle's Bob the Builder Party! When the party guests arrived… they were met by this sign hanging near the front door. When they stepped inside, we had a large wheelbarrow next to the door to hold all of the birthday presents. 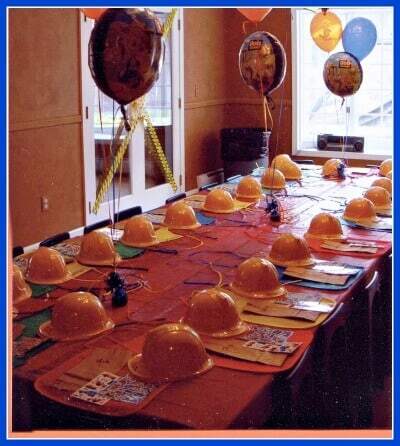 The party goers were invited to the table where they could decorate their construction hat and their “prize bags”, and don their construction apron too! This was our “opening activity”. We had four party games planned, that were manned by our very helpful Grandmas and Grandpas….. the first was “Roley's Race Track”, where the kids could race little Bob the Builder cars and win a prize. The second game was “Pin the Wrench on Bob” (a la Pin the Tail on the Donkey)…. but I quickly learned there that 3 year olds wanted no part of wearing a blind-fold!. The third game was Bob the Builder's Fishing Hole where the guest would put a gummy worm on the end of a fishing pole, and dangle the line over the top of a sheet that was hung at kid-height across a doorway where my father was hidden on the other side of the sheet, and would take off the gummy worm and replace it with a package of fruit snacks. 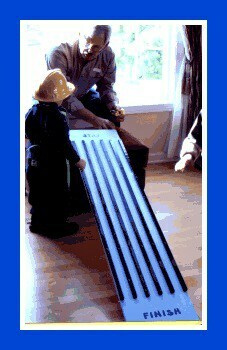 The kids loved this game! 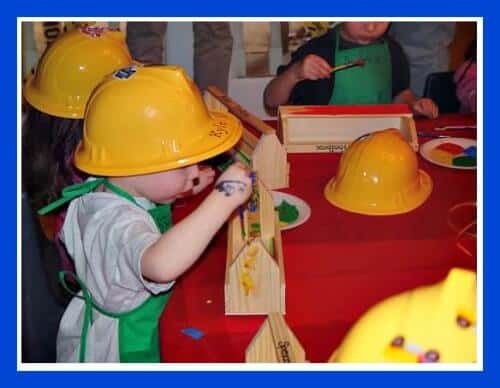 The final station was “Scoop's Tattoo Parlor” where the party goers could receive a homemade Bob The Builder tattoo of his or her choosing! After the craft, I gathered all of the party guests into the other room, where I read them the story “Bob's Birthday”. While this was going on, my hubby and the Grandmas cleaned up the tables, and readied them for lunch. The kids could choose from homemade chicken nuggets, tator tots, fresh fruit, cheese cubes, pretzels and goldfish, salad, juice boxes, and water. 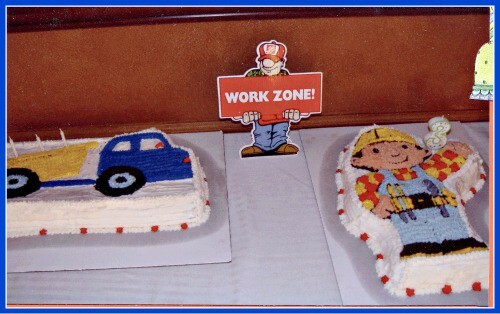 Bob the Builder Birthday Cakes! All Parties Need an “Exit Plan”! This party was so very cute- and I loved going back and admiring these pictures and remembering that special day….. but really- it was a ridiculous amount of work! 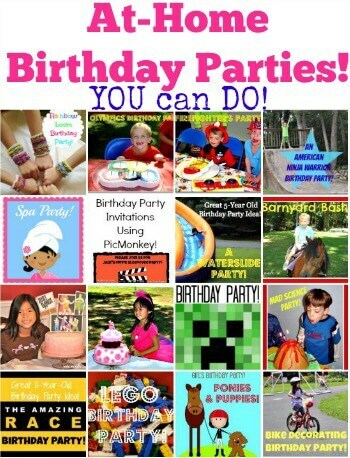 As time went on, and I got a few more of these birthday parties “under my belt” I learned how to simplify it a bit, and still make it a fun and magical day for the birthday girl or boy! « So how’s it going with those New Year’s Resolutions? 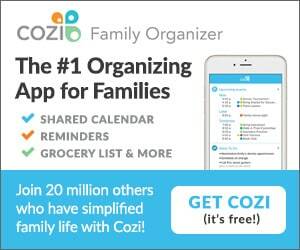 Hi there– I am planning a similar (crazy) party. Where did you find the toolbox kits? I have been looking for some that aren’t too expensive. I need about 20 and trying not to break the bank. I love your ideas! 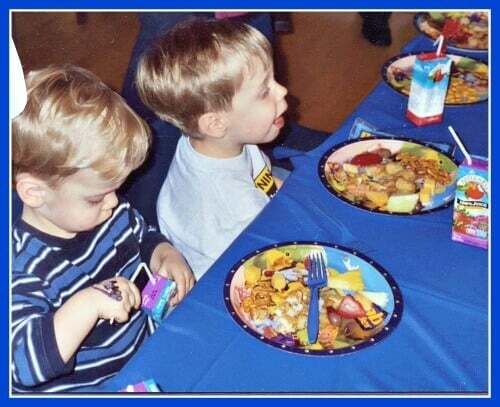 Ah- my first-ever birthday party was about 9 years ago…. 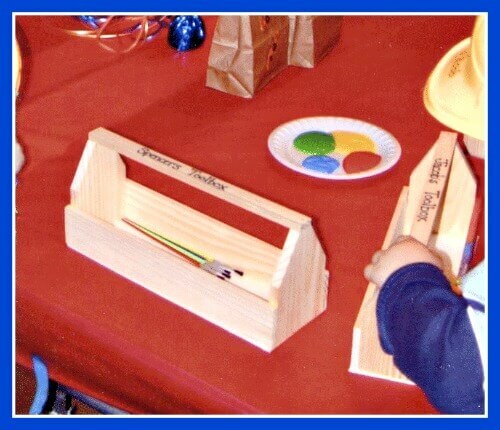 so I can’t recall where I purchased the wooden toolkits. 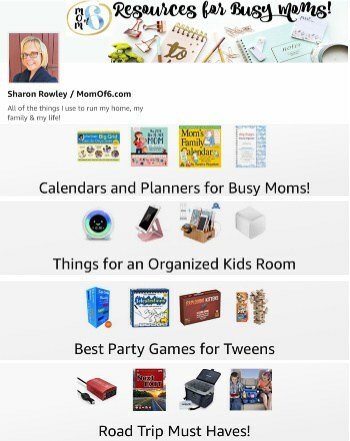 But I feel like it was an online wooden craft supply company…. and they were not hugely expensive- maybe $3-$4 each. And my husband had to put them together one by one! That was the hard part! 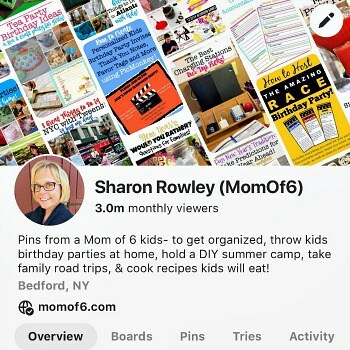 I know this is an older post but I’m a new reader planning my son’s first birthday and I’m loving your party plans!! I remember it well. I wondered how you’d ever top it.